So you found the perfect apartment. It checks nearly all of the boxes on your must-have features list; whether they be oversized windows that flood the space with natural light, or original details that showcase its history without looking outdated. It has hardwood flooring and it has a dishwasher. It’s fresh, it’s simple, and it’s exactly what you need. Except, it doesn’t have a closet. This is what happened to me, and I know I’m not alone. When I first began my apartment search, I prioritized closet space as one of the most important pieces of the puzzle in the hunt for the “perfect place”. Or at least, that’s how I thought it should be after watching years and years of House Hunters, where home buyers are quick to cut homes from their lists without walk-in closets and unfinished basements to store all of their stuff. At the end of my search, I ended up signing the apartment with very little closet space. I have yet to regret that decision. In fact, I’ve had fun finding alternative ways to store my clothes. Especially as minimalism continues to trend, simple and stylish ideas for small closets are not in short supply. Looking to make your own closet in a small space? Check out a few of my favorite ways to store your wardrobe and showcase your style. Gone are the days of conventional dressers and wardrobes. If a piece of furniture is going to play a major design role in your bedroom, find something you’ll enjoy looking at every day. File this idea away as one of my favorite unconventional dressers. The contrast of the industrial style of the cabinet with the warm wood tones pair excellently in this space. It’s dainty instead of bulky, and a bit retro. This stunning antique piece deserves to be the center of the room. After all, what’s lost in space is gained in style — this make-shift closet looks like a little boutique. The unique (and unexpected) chandelier also makes this corner extra special. Putting your clothes in a dresser or wardrobe doesn’t have to mean hiding them. This glass-fronted cabinet gives the room both personality and storage. Here’s another glass-fronted cabinet, which makes for the some of the most beautiful shoe storage I’ve seen. Because your closet is where your clothes live, give them a nice home. This plywood rack could easily take on a few more shelves for storage, and would be a simple DIY for someone with a few carpentry skills. Ok, one more file cabinet. Too cool. Garment racks have become the icon for minimalist closets. They come in a wide variety of colors and styles, as well as price ranges. I found mine at Ikea for less that $10. It’s black, and more study than I expected for something so inexpensive. It’s perfect for my space, and I love the aesthetic it gives my room. Garment racks can be packed with as much or as little clothing as you’d like, but for a cleaner look, go with as little as you can. Color coordinating is a very popular look when it comes to styling a garment rack. Have too many busy colors and patterns for your liking? Designate a drawer for your wilder items. This gold bar gets a gold star for both functionality and design, and mounting it into the hardwood makes it look completely belonging in the space. It’s slightly reminiscent of a ballet bar to me. Another shiny gold bar for clothes to hang out on. Children’s clothes are so undeniably cute, so why stuff them into drawers where they’re mostly unseen? The tree branch that creates this rack keeps things playful and rustic. Keep your floor space clear by hanging the clothing bar from the ceiling. That way, you’re also free to add a dresser below. For something a little less modern, this shabby chic hanging rack made of twine and tree allows for a softer and more natural look. If you don’t want to see your clothes all of the time, consider hanging a curtain between the closet area and bedroom. Here, the soft look of the white curtain behind the bed makes the space feel extra-luxurious. Installing shelves is a task that can seem daunting, but should not be feared. Shelving is easy to install and can completely upgrade the look of a room — not to mention add a lot of storage. With the addition of shelving, this corner under an eave goes from an underutilized space These geometric pieces can be used as a unique way to hang clothes, as pictured. You could also slide a shelf through the center to create a shelf. This high shelf gets less-used items off of the floor or out from under the bed. 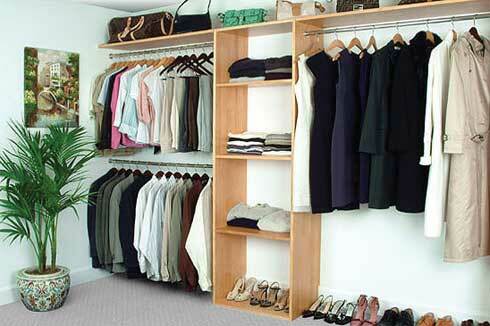 It frames the clothing racks without making the space look cluttered or cramped. With the addition of shelving, this corner under an eave goes from an underutilized space to a cozy closet with tons of storage. Last but not least, you can combine all three ideas: Furniture, hanging racks, and shelving. All so easy to create in your own room. Of course, all of this becomes easier if you have less stuff in the first place, right? If you’re in need of a plan to get started, read my post on decluttering your apartment. Let me know your thoughts and ideas in the comments, or send us some love on social media!